Lets You Create An Amazing Website In 10 Easy Steps. With over 190 pages of content. You’ll find this guide to be an amazing resource with easy steps to help you through the entire process of creating your website. *Quickly and easily install WordPress. *Master the navigation and customization of the WordPress dashboard. *Choose (and activate) the right WordPress theme for you. *Create content, blog posts, categories, permalinks, and more. *Create, upload, edit, and organize your video, audio, and images. *Make an effective Content Management System (CMS). 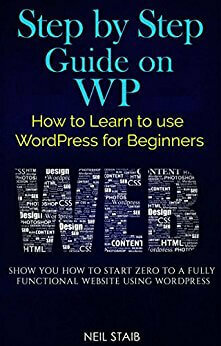 *Optimize your WordPress site for search engines. *Install and create your contact forms. *Fine-tune and customize your WordPress theme. *Enhance your website with widgets. *Take your website to the next level with plugins. *Integrate social media, networks, and feeds into your website. *Confidently back up, maintain, and secure your WordPress website.